Bonita Gutierrez is here with us, today. Bonita, can you tell us a bit bout yourself and how many books you've written? Bonita: I'm an actor/producer turned author. Over the years, I've worked in film and television, produced and acted in plays and wrote an award-winning short film — Cantar. In addition, I manage my entertainment company, Nemesis Kitten Entertainment. I'm also a martial artist, with a background in Jeet Kune Do (Bruce Lee's martial art), Kenpo MMA and Kali Escrima (stick and knife fighting). I'm an avid runner, film buff and Star Wars geek. Together with my writing partner, Camilla Ochlan, I've written five books in The Werewolf Whisperer series, with a sixth — Blood & Bones— due out later this year. Me: Sounds like you're a busy lady! What's the name of your latest book and what inspired it? Bonita: Camilla came up with The Werewolf Whisperer after being inspired by the on-set dog trainer of her short film, Dog Breath. We were both coming off of film shoots when she pitched me the idea about a "werewolf apocalypse" and a cop with a special knack for training dogs that turns into an even more bizarre knack for commanding werewolves. I thought it was an awesome idea. 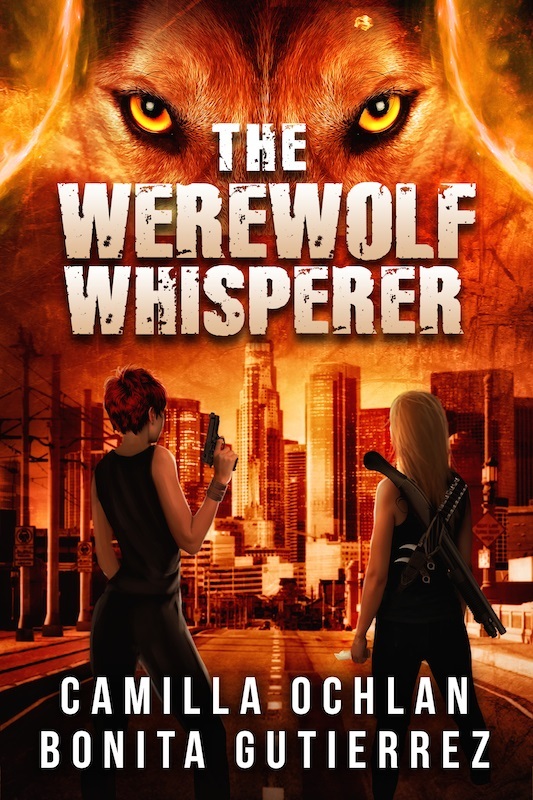 Originally, The Werewolf Whisperer was conceived as a webseries. We even wrote the first thirteen episodes of season one. We had every intention of shooting the series, but as The Werewolf Whisperer world grew, so did the budget. As is often the case in Show Biz, our imaginations had exceeded our means. But we didn't let that get in our way. We knew we had a great story, and we wanted to tell it. So, we got to work translating the webseries into a novel series. Me: Yeah, I've found my imagination often does a better job than low-budget special effects. ;-) What are you working on now? Bonita: Under our newly formed Empyrean Press banner, Camilla and I are feverishly working on Blood & Bones – The Werewolf Whisperer Book 3, while simultaneously releasing a serialized novella about one of our favorite characters — KAI. Right now, the episodes are exclusive to our Beasty Bites newsletter subscribers, but we have plans to eventually release it as a book. On top of all that, we're developing a new urban fantasy series. So, stay tuned! Me: Cool! What authors, or books, have influenced you? Bonita: Writers of all mediums (film, television, comics, books) have influenced me at one point or another. I'm especially drawn to writers who create deeply flawed characters. I love anti-heroes. Humans are imperfect creatures. It's what makes us interesting. So of course, I love Joss Whedon. His characters are chock full of flaws. I’m also a huge fan of Greg Rucka's (his Queen & Country series is one of my favs). I'm also into Chuck Wendig, Maggie Stiefvater, Delilah S. Dawson, and indie author Meg Collett. But my all-time favorite writer is Shakespeare. No one writes an anti-hero like the Bard. That being said, the greatest influence on my writing would have to be my husband. He's a professional screenwriter and has taught me so much about the process — of the all-consuming need to get the story out on the page. And that good writing starts with a good story. If you don't have a good story, you've got nothing. Me: So true! What are you reading now? Bonita: I read a lot. I often read two or three books at a time. I also love to listen to audiobooks (especially in the car while stuck in L.A. traffic). I just finished four amazing Star Wars novels (you can read my review on my Bonita's Geeky Blog-FU! site). And in the spirit of supporting my fellow indie others, I try to read as much of their work as I can. I just finished an awesome dark epic fantasy called The Blighted City by Scott Kaelen. And I'm about to start two more books: Penllyn by Troy A. Hill and Suckers by Jackie Dahlhaus. I'm also digging Greg Rucka's comic series, Lazarus, and Kieron Gillen's The Wicked + Divine. Me: Yeah, there are some fabulous indie reads out there. :-) For those who might consider reading your book, what would you tell them to expect? Bonita: The Werewolf Whisperer is an emotionally grounded, action-packed genre bender told from multiple points of view and in dual timelines. It's about two women joining forces to help (and sometimes hunt) individuals afflicted by a mysterious virus that's turned them into werewolf-like creatures. But all is not as it seems. Not for the women. Not for the Afflicted. And not for a society coming to grips with a new world order. This ain't your grandma's werewolf tale. Me: Sounds interesting! What's your favorite part of being an author? Bonita: As an actor/director/producer, I've always been a storyteller. But, I never thought I'd be writer let alone an author. It wasn't until my husband encouraged me to write my own scripts and get my work out into the world that I entertained the idea. I'm so glad I did. Otherwise, I'd have never found this new creative side of myself. The Werewolf Whisperer gave me the confidence to grow in new ways as an artist. So for me, that's the best part of being an author. Me: That's awesome! Do you have day job as well? Bonita: In addition to building Empyrean Press, I run my entertainment business (which is more of a twenty-four/seven job). And even though I've been away from acting for a while, I do plan to return to the film and television arena eventually. Me: Break a leg! ;-) What are the hardest and easiest parts about being a writer? Bonita: Lately, the hardest part about being a writer for me is finding the time to write. Creating awareness for my books and getting them into readers' hands (or Kindles) is a full-time job. The world of marketing is always evolving, and I have to evolve with it. Be constantly learning. But the fun comes when I get a great review or a reader tells me how much he/she loved my work. That's the best (and easiest) part about being a writer. Me: I agree, it can be hard to convince people to give your books a try when you're an indie author. What genre do you place your books in? Bonita: The Werewolf Whisperer is an urban fantasy series with elements of science fiction that's laced with biting humor. Think Shaun of the Dead meets Supernatural with a healthy dose of Planet of the Apes. There are currently two novels and three novellas in The Werewolf Whisperer series. Me: Sounds like a geek's paradise? :-) And, so all these fine folks can find your amazing series, are there any links you'd like me to post?